In any aspect of life, experience always plays a key role in determining success. However, in an ever-changing and fast-evolving business world, sometimes, even those with the most experience can fall short by succumbing to common mistakes. In the eyes of a recruiter, a prospect’s experience always gives him a competitive advantage that sets him apart from the group. This is understandable. It’s always a good idea to have someone on your team that has actually proven that he has done the necessary work in the past to prove that they are worthy of a position. That is why recruiters hold their own experience in hiring and recruitment to high regard. 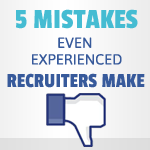 Although, one has to always be wary of these common mistakes that the most “experienced” recruiters make. Your experience as a recruiter may end up backfiring on you. The life of a recruiter can get somewhat routine and repetitive at times. An experienced recruiter will most likely have conducted hundreds, maybe even thousands of interviews. An experienced recruiter has most probably gone through stacks and stacks of different résumés containing different faces with the same achievements, goals, and aspirations. These common recruitment processes can often become too mundane for the recruiter who has seen and heard it all. It may even come to a point wherein a recruiter can accurately predict a prospect’s answers during an interview. Be careful when this happens. As a recruiter, you might have a tendency to become too complacent and stop listening to your prospective hires altogether. Overconfidence in your abilities to predict the outcome of an interview may prove to be costly. So treat each interview and each prospect with great diligence and pay attention to the details. Yes. Multi-tasking is a very handy asset for those gifted enough to be able to do it effectively. However, experienced recruiters may tend to develop a certain level of overconfidence in their abilities to take on multiple tasks at a time. In situations like this, multi-tasking becomes counterproductive and it’s best to avoid this scenario at all costs. Multi-tasking can often impair an individual’s ability to concentrate on a task at hand. To avoid this mistake, try plotting your work day in an organized and orderly manner. Set proper schedules for when you need to answer emails, browse through résumés, conduct interviews, and other daily tasks. If you feel tired or burned out, take a deep breath and make some time to relax and clear your mind. A cluttered mind can often spell disaster even for the most experienced ones. This is another common mistake that can be attributed to those professionals who have been playing the game for quite a while. As veterans in the field of hiring and business, one may end up developing a certain stubbornness and self-righteousness when it comes to affairs in their fields of expertise. This might give them a false sense of entitlement, resulting in them interrupting candidates and potential hires during interview processes. An experienced recruiter should always value each candidate individually with care and attention. Refrain from interrupting them even when you feel like you know they’re not going to give you a satisfactory response. Always embody the principles of a good listener. When a recruiter is experienced enough to have developed an efficient routine with how he conducts work, it may help speed things along in an incredibly critical and long hiring process. However, when one develops a routine at work, the recruiter might end up becoming too robotic with his work. Sometimes taking a pause in the action to slow down, and sometimes stop to critically assess certain situations that you encounter as a recruiter can help juice up your work life. Becoming too robot-like with how you conduct business may take the life and passion out of what you do and that may spell potential dips in your efficiency and productivity as a recruiter. True. Your experience has been good to you. It has helped sculpt and mold you into the successful recruiter that you are today. You are one of the best at what you do and everyone knows it. Although, don’t let these beliefs ever serve as excuses for you to lose your drive to learn. There are valuable lessons that need to be learned every day. This is what separates the good from the great. The best recruiters realize this and humble themselves so they strive to learn and acquire more knowledge and wisdom about their fields of expertise. Leave your ego at the door and recognize that the competitive business world is evolving day-by-day. New trends are developing as each minute passes by and you have to constantly be on your toes to stay on top of your game. Don’t feel like you “know it all”. You should always approach your work with an open-mind and an attitude that is willing to learn. Don’t be too confident with all your acquired experience because you are still susceptible to mistakes. Nobody is perfect. Try avoiding these mistakes as much as possible, and your experience will surely drive you to the top of the recruitment food chain. What do you think of above article? Let us know in the comments below. Hi, I am Prafull co-founder of HireRabbit, an easy way to build employer presence and recruit on social networks. I share tips about making more out of recruiting on Facebook, Google+ and Twitter. You can find me on LinkedIn, Google+ or Twitter, I would love to connect. Could Your Recruiting Process Be Turning Off Top Candidates?